To many of us loose leash walking seems like a myth, something only achieved by professional dog trainers. I’m going to let you in on a little secret – a dog backpack is the only tool you need for a better walking experience. You won’t have to worry about being dragged 3 blocks everytime your dog spots a squirrel. Do yourself a favor and consider getting your dog a backpack. Laika isn’t always the most cooperative of models, especially when she has her backpack on. She knows it’s time for a fun exciting hiking adventure when I get out the backpack, so she was probably confused when I stopped to take a few photos. 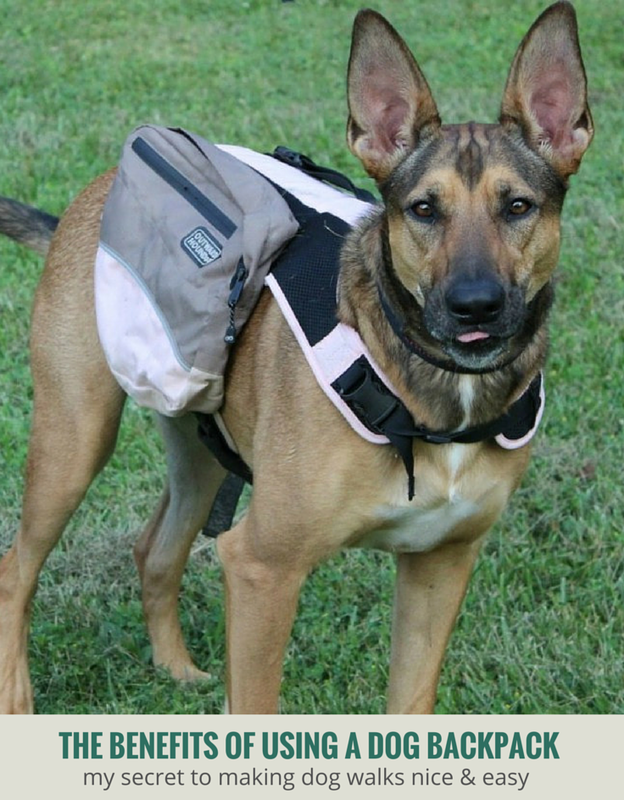 Some people swear by dog backpacks, saying that it gives your dog a job to do. That might be true but I love them for the convenience they provide for me. I don’t have to worry about carrying around my water, keys, wallet, food, etc. She can carry some of the weight for me, and she does so happily. I love a good harness but even the best can’t compare to how much added focus I get from Laika when I use a dog backpack. It doesn’t even have to be completely filled; we usually just go out with a couple of water bottles. To many loose leash walking might seem like a myth, but if you use a backpack it’s so much easier. If I ever find myself training another dog to walk on a loose leash I’d introduce a backpack much sooner. It makes it so easy it almost seems like cheating. Using a dog backpack does seem to tame dogs that would otherwise be unruly on walks. When I was first training Laika to walk on a loose leash I was having a lot of difficulties. When I introduced the backpack into the mix she seemed to get more focused on walking rather than running ahead and pulling every second. It can be a really nice training tool as well as a nice convenient way to carry your stuff. I know Laika gets excited when I get out her backpack so I assume she loves it, but to be honest she might just love the fact that she knows it’s going to be a longer walk when I get it out. She also gets a ton of compliments when she’s wearing it. This Kyjen Outward Hound dog backpack is actually the second backpack we’ve owned. She simply outgrew the first one when I mistakenly bought it before she was a year old. Laika is 75 lbs. and wears an X-Large and it fits her perfectly. It’s not too lose and it doesn’t cause any rubbing issues under her front legs since it’s well padded. Dog backpacks are like magic when it comes to creating calmness on walks. We recently purchased a second Outward Hound dog backpack after Laika outgrew her first. If you’re looking for an inexpensive (cheap) dog backpack Outward Hound has a great selection of decently priced backpacks. We went with the Kyjen for $20. When it comes to putting a price on a smoother walking experience I’d say it’s well worth it. To accurately measure your dog for a backpack start by measuring the circumference around the thickest part of your dog’s chest. This is their girth measurement and the most important number when ensuring proper sizing. The straps on Outward Hound backpacks are adjustable, but you don’t want to leave too much room. It should fit snug across their chest while still being able to place a few fingers under the straps. The neck measurement isn’t the same as it is for a collar. Instead of fitting up high on their neck dog backpacks are designed to fit on the lower part of a dogs neck on the upper chest area. The first day we went out with this backpack it was a muddy mess outside. At one point Laika decided to roll in some mud puddles, you know, for fun. Luckily the backpack was easily cleaned off with a towel and water. It is not recommended for machine wash. The backpack itself works great for carrying items but you need to make sure you take appropriate measurements to ensure you get the right size. 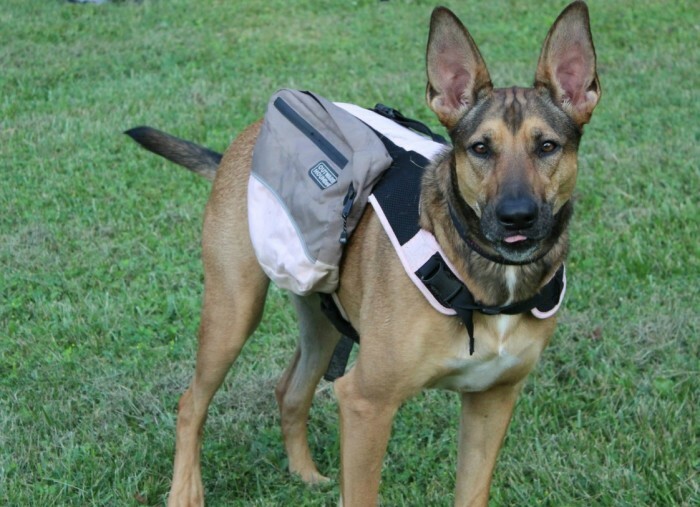 The backpack does have adjustable straps on the front and underside of the belly to get a good fit for your dog. I haven’t noticed the straps becoming too tight or leaving any marks, it seems to be quite comfortable for her. I have read some dog backpack reviews from customers with smaller breeds that say the bags are too large for the dog. But for medium and large breeds they seem appropriate and not too bulky. It took a few tries before she willingly accepted wearing it. Any dog that isn’t used to wearing a backpack might have a bit of reluctance at first. It didn’t take long before she willingly learned to sit still while we put it on. She knows she’s going for a nice long walk so she’s definitely willing to wear it. The ‘saddlebags’ on the sides are actually quite large. For Laika I can easily fit 2 normal sized (20 oz) water bottles on each side and some extra dog walking necessities, like dog poop bags. We could fit in quite a bit more but when we’re just going out for a leisurely walk or hike we don’t have a need for much. 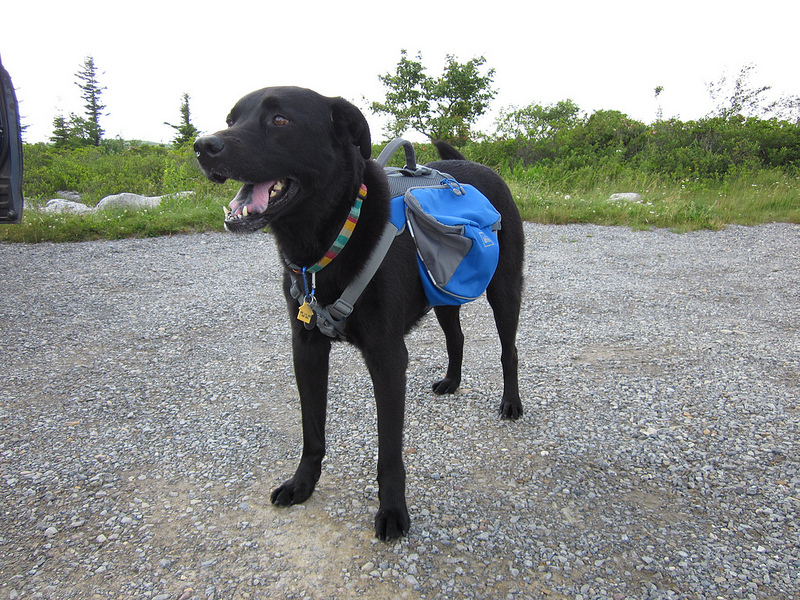 If you were going out on a camping trip a dog backpack could be extra nice to carry extra supplies. We’ve gone on a few outings where I fit a lot more into the bags but for everyday hikes I stick to a few water bottles and some food. To stop the backpack from slipping you need to make sure you distribute the weight evenly on both sides. It will slip around if not distributed properly. 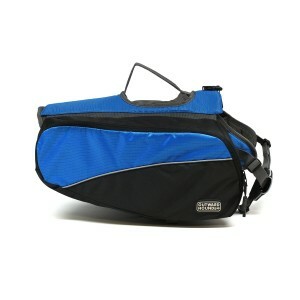 The pack is removable so you can take the weight off your dog while you rest or of they seem uncomfortable carrying it. How Much Can Your Dog Carry? 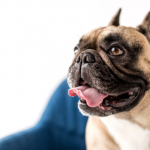 In general young, healthy dogs can carry about 25% of their weight comfortably. Some breeds can carry much more, some much less. 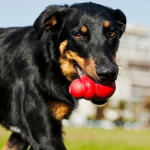 If you have any concerns you can do some practice runs with your dog before going on a strenuous hike. The dog backpack does not have a hook for your leash. You can easily fit your normal leash through the release hatch or just use your normal collar ring. Something like an EZ walk harness (my personal favorite) could be worn under the backpack if you are more comfortable walking with a harness. The backpack itself is very durable, after many outings everything is still in one piece. The material itself it thin lightweight so I was worried it might rip. It’s help up extremely well. No scratches, tears, missing zippers. All of the velcro and buckles are still in perfect condition. If you’re looking for a nice dog backpack for simple hiking or walking with your dog the Kyjen Outward Hound Dog Backpack is a great choice. It’s a great way to carry all your extra stuff while enjoying the great outdoors with your dog. It might take a few trips for your dog to become completely accustomed to the backpack but if you introduce it calmly and slowly you shouldn’t run into any problems. The dog backpack review rating of the Outward Hound is impressive. Though if you have a small dog I’d recommend reading a few more reviews because the bags might be too large and bulky for smaller breeds. Backpacks are a great training tool if you have a dog that tends to be overstimulated on walks. Backpacks are an easy way for you to get your dog more focused on walking, rather than lunging and running ahead. If you’re looking for a nice everyday dog backpack I’d recommend the Kyjen. If you’re looking for a durable, inexpensive dog backpack check out the Kyjen Outward Hound models. They’re the best option in the lower price range and they’re quite durable. Kyjen Ouyward Hound dog backpacks are available on Amazon – prices and sizes will vary. If you struggle with your dog pulling on the leash or just want a simple job for your dog to do while walking – do yourself a favor and get your dog a backpack – your arms, back, and sanity will thank me later. You know, I never thought about putting a pack on any of my dogs when we’re just going for an everyday walk around the neighborhood, but your post has given me food for thought. I’d love to try it one out and see if it calms down my two maniacs. What a great idea. 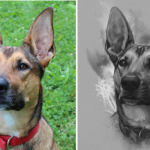 It worked for Laika but like anything your results may vary. I think when we initially started using it she was just confused so it calmed her down immediately lol. I had an Outward Hound backpack once, and was really impressed with its quality. Surprisingly, it was too big for my girl. I couldn’t believe it. Awesome review! We got to attend an Outward Hound/Kyjen product testing event recently as their offices are here in Colorado. I have been wanting to try a pack for Ruby to see if it helps her focus on walks. Thanks. It definitely helped for Laika; I’m just not sure if it’s because it’s distracting or if it makes her feel like she’s doing a job. Either way I look at it as a win for me. This is something I think about from time to time to help the dogs relax when we walk. Thanks for the great review, I wouldn’t have a clue with where to start otherwise. I have been curious to try one with Ruby to see if it gives her that “job” mentality. Boca got an Outward Hound pack as her thank-you gift for the video shoot we did with them, but she hasn’t worn it yet. I think it will be great for hiking! I still don’t know if it’s more of a job or more of a distraction for Laika; I like to think she feels important carrying stuff around but I guess it could also just her paying more attention because it seems to make her walk really smoothly – almost as if she’s balancing more. I might be over analyzing how she feels about it but she doesn’t seem to mind at all – gets excited when I put it on her – and acts much more civil at the park.